Authors: Pieter van Dokkum et al. 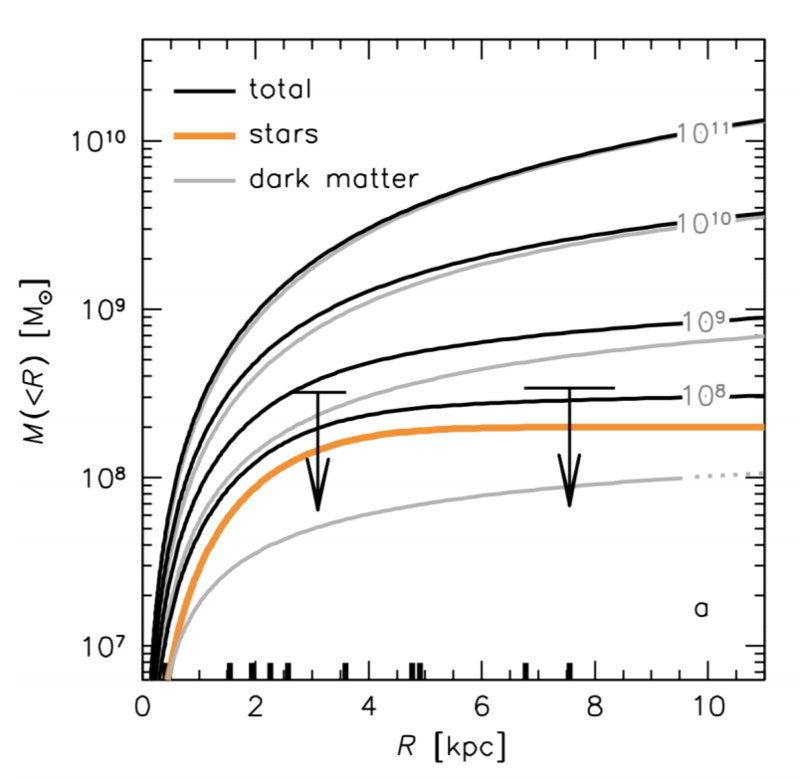 Dragonfly has already proved its usefulness in constraining the dark matter-stellar mass relationship, having found amongst other things a galaxy that is the same mass as the Milky Way (~1012 solar masses) but is mostly dark matter. In this paper however, the authors discuss a very different sort of galaxy — a galaxy with almost no dark matter at all. The galaxy in question is NGC1052–DF2. It is located in the constellation Cetus near the much brighter galaxy NGC 1052 (See Figure 2). Based on observations of NGC1052–DF2 and NGC 1052, the authors pegged NGC1052–DF2 at roughly 20 mega-parsecs away. NGC1052–DF2 has been imaged before; what caught the authors’ attention this time was how different it looked in Dragonfly images and images from the Sloan Digital Sky Survey (SDSS). 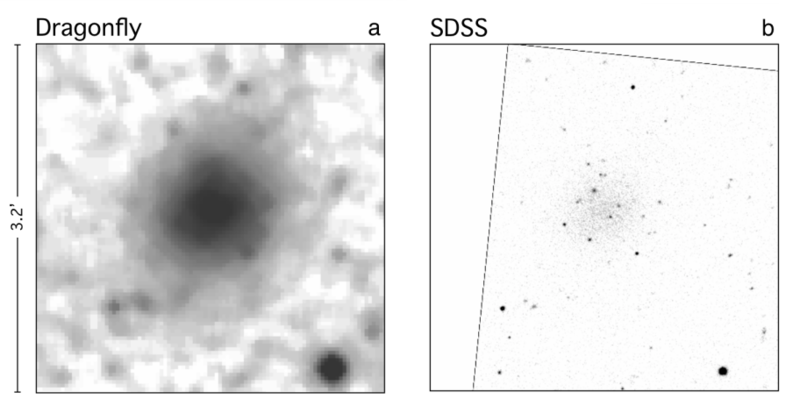 While the galaxy appeared to be a large dim object about 2 arcminutes across in Dragonfly, it showed up as a collection of point sources in SDSS (see Figure 3). 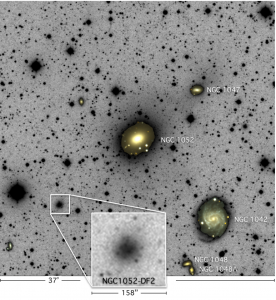 Of these sources, ten bright compact objects were checked via spectroscopy to determine whether they were part of the same body, namely NGC1052–DF2. If they were, they could be used to understand the mass distribution of the galaxy. 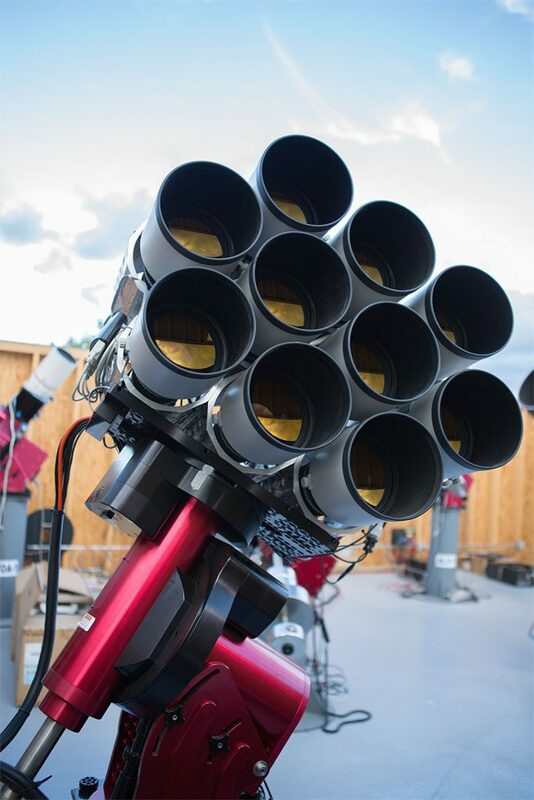 The spectra determined that the ten objects (which are deemed globular clusters for the time being) have a small velocity dispersion, that is to say, the velocities of individual objects were very close to the mean velocity of all ten objects. This meant that they were extremely near each other, backing the idea that they belonged to NGC1052–DF2. The proximity of the objects also suggested that their host galaxy was on the smaller side. Since dark matter cannot be measured directly, the amount of dark matter in a galaxy is determined by using tracers to roughly figure out the total mass of a galaxy (called its dynamical mass, defined here by the incomparable Vera Rubin). The galaxy’s total mass is then compared to its visible stellar mass to determine how much dark matter it contains. Using the globular clusters from earlier, the authors determined that NGC1052–DF2’s dynamical mass is less than 3.4 x 108 solar masses while its apparent stellar mass is about 2 x 108 solar masses (see Figure 4). This leaves very little room for dark matter! While the formation history of NGC1052–DF2 is unknown for now, the authors present some suggestions. The galaxy might have been created from gas flung out by merging galaxies, a hypothesis that is backed by its velocity and proximity to a large elliptical galaxy. It could also have been formed by gas that was swept up by quasar winds, which is likely given its location and environment. However, NGC1052–DF2 is a bit too large and dim for what would be expected from that formation mechanism. Yet another suggestion is that it may have formed from gas flowing towards NGC 1052 that never reached the larger galaxy. In any case, NGC1052–DF2 is living proof (so to speak) that galaxies can exist with very little dark matter. This supports the claim that dark matter can be separated from regular baryonic matter as was evidenced by the Bullet Cluster (discussed in this Astrobite). The existence of NGC1052-DF2 also suggests that theories relying on the absence of dark matter-poor galaxies need to be reconsidered. NGC1052–DF2 might not be the only one of its kind for long. The authors report that there are objects similar to it that will be followed up on very soon. Here’s hoping that we get to discover more of these light-hearted galaxies in the near future! The author would like to thank Dr. Roberto Abraham and Dr. Pieter van Dokkum for sharing an advance copy of the paper discussed. Dancing in the Dark Where Did All the Dark Matter Go? Finding dark galaxies from their tidal imprints No Missing Satellites?